Home \ Blog \ Leslieville and Riverside News: The Riverside Antler Breakfast! Leslieville and Riverside News: The Riverside Antler Breakfast! We are pleased that the team of Chef Scott and An Sibin are once again hosting the Annual Riverside Antler Breakfast. It is next Friday morning at An Sibin Pub! Our poster is below, and attached. 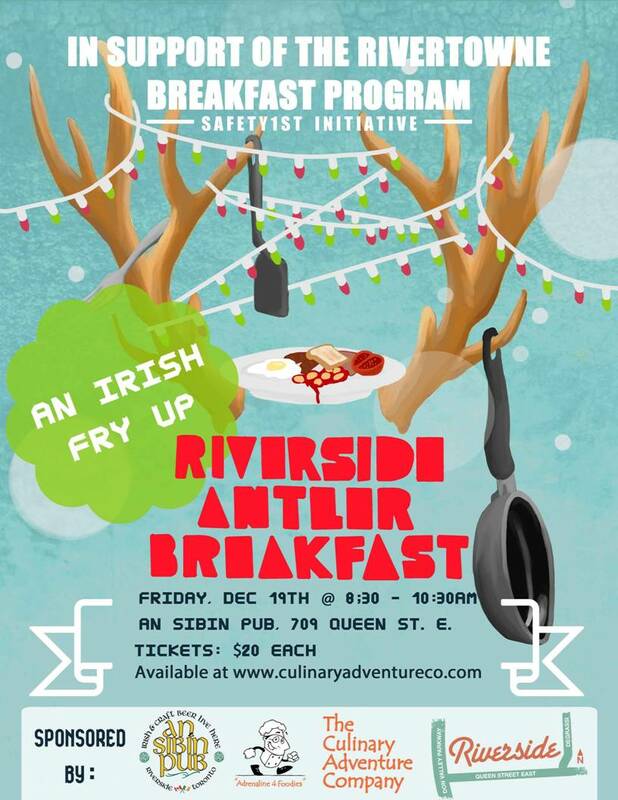 Chef Scott and Publican Scott Brockington will be hitting Queen St East tmw afternoon selling antlers and tickets for $20 – you can get a hearty Irish Fry-up – and support the Rivertowne Breakfast Program. The breakkie runs from 8:30 – 10:30 at An sibin Nov 19th. There will be food and fun for all – Santa, Raffles, Treats, Entertainment and more. Please plan to spend a few moments with your friends and give back this holiday season. If you are not able to attend, we are gratefully accepting donations for the Rivertowne Breakfast Program. We are also asking for donations of door prizes – please contactoffice@riverside-to.com if you have any items to donate.